Operation principle: when motion is detected, the signal is transmitted to the receiver. 1. Unpack the wireless motion detector. 2. 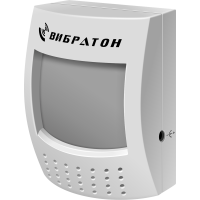 Press the clip at the rear panel of the motion detector and open the battery door. 3. Set the ID code corresponding to the base unit using microswitches (if necessary). The default setting: all microswitches are in ON position. 4. Insert the battery (6F22) or connect the motion detector to the external power supply ( 9V, 100mА). 6. Attach the wall mount at the best view point using self-tapping screws. 7. Fix the motion detector in the wall mount. 8. Direct the motion detector towards the center of the sector, the motion in which must be signaled about.